Are Minimum Purchase Requirements Illegal? Whenever you pay with a credit or debit card, merchants have to pay fees to process your payment. As a result, some retailers set minimum purchase requirements. For example, they might require that customers spend at least $10 to pay with plastic. Minimum purchase requirements are technically not illegal, but they are certainly an annoyance to customers. 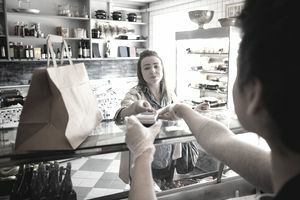 What’s more, merchants may be breaking the terms of their agreements with payment processing providers when they impose minimums. Some consumers believe that debit card minimum purchase requirements are illegal. The confusion comes from several laws that went into effect in 2013 governing how merchants deal with customers who pay with plastic. Two major changes took place, but neither of them outlawed minimum purchase requirements with debit cards. Minimum purchase requirements for credit cards are allowed, up to $10. Merchants can set minimums for credit card purchases if they want to. That’s a result of a lawsuit merchants won against credit card companies and banks. In the past, merchants would set those limits “unofficially." The law did not address the issue, but it was technically a violation of the merchant’s agreement with credit card companies. Now, credit card companies must allow merchants to set credit card minimums, and the U.S. Government set the limit at $10. Adding surcharges to credit card payments is also allowed. Again, this applies to credit cards only. Because merchants pay fees every time you pay with plastic, they’re allowed to pass some, or all of, that fee on to you. However, some states outlaw the practice—even for credit cards—so it depends where you are. For more details, read about credit card surcharges. Credit cards are payment cards that allow you to borrow money from the card issuer. But you don’t necessarily need to take on debt. Instead, you can pay off your card balance every month. Debit cards draw funds from your checking account (or a prepaid balance). What’s the difference between how these types of cards are handled? For whatever reason, the law does not address debit card transactions from a consumer perspective. The laws did limit how much retailers have to pay when you pay with a debit card, and the costs for accepting debit cards are typically lower than the costs of accepting a credit card. This is true even if you, the buyer, use a debit card but choose a “credit” transaction at checkout. Presumably, lawmakers assumed merchants would have no reason to restrict inexpensive debit card payments. However, some debit cards are more expensive to process than others. For example, debit cards issued by small institutions can be more expensive than large institution cards. So, are merchants allowed to do whatever they want when you pay with a debit card? No. A merchant's agreement with card processing networks prohibits them from setting a minimum purchase amount for debit card transactions. Minimum purchase amounts cannot be applied to transactions that are processed with a debit card. That same document provides instructions on training staff to spot the differences between debit cards and credit cards. What can you do about merchants who break the rules? It’s best to let them know that you think they’re doing something wrong. Especially when it comes to a small business, the business owner might not be up to speed on all of the laws. Things change quickly, and business owners have a lot on their plates. Starting a conversation with your local business owner might be helpful for everybody. You might even feel some sympathy for them. Accepting plastic is almost a necessity, but it’s expensive. Although the fees for accepting a debit card are generally far lower than credit card swipe fees, there’s still a cost. Keep that in mind as you make purchases, and pay with cash or check if you can. It may help your favorite business stay afloat, and it will help keep prices down for everybody. If you believe that a business is blatantly ignoring the rules, you can report them to the card processing networks if you like. However, because the merchant isn’t breaking any laws by setting minimum purchase amounts for debit cards, there’s no reason to report the business to your state’s Attorney General or to the Federal Trade Commission. Merchants can set whatever policies they want as long as they do not break federal or local laws.